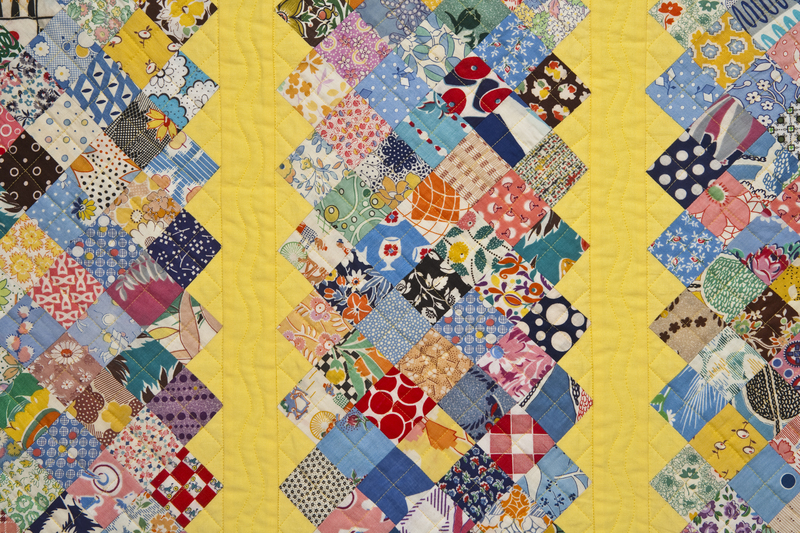 As previously confessed, my favorite design source is vintage quilts. I saw this beauty for sale on eBay, and loved it right away. Not a great photo, but you get the idea. Since I had found at an antique store a box containing about billion 2″ squares of vintage fabrics, I realized immediately that this pattern would be a perfect use for those squares, and I added many, many more patches from my own collection. 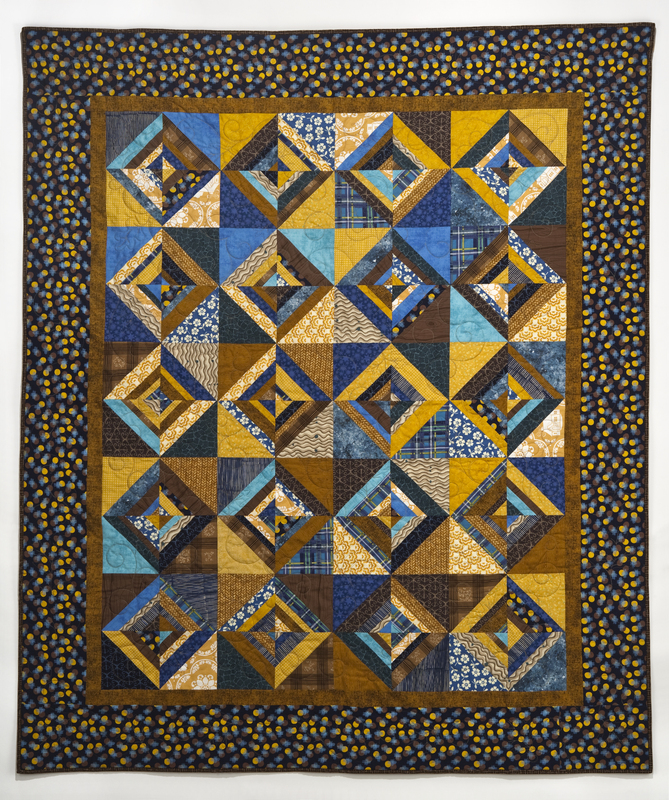 I used yellow because it was the best color from my vintage solids collection, and I had enough to make the quilt just this big. I started sewing these squares together at a retreat last January, and continued sewing the various patches whenever I felt like mindlessly sewing. I liked the solid patch between the columns better than the strip of fabric used in the original. This was tons of fun to make. The quilting took forever, but I wanted it to be very simple, and that took some doing. This may be a first for me—posting someone else’s quilt on my blog, but I could not resist. This is a quilt my daughter Maggie made for her friends Kristin and Saja for their wedding. She used the blues and golds they chose for their wedding colors for this gem, and I think it’s fabulous. When I asked Maggie if she wanted me to say anything in particular about the quilt when I posted it, she told me I should say, “Look how awesome my daughter is! Are your kids this talented? No.” A great quilter with an equally great sense of humor–love it! Happy New Year ! ! ! ! 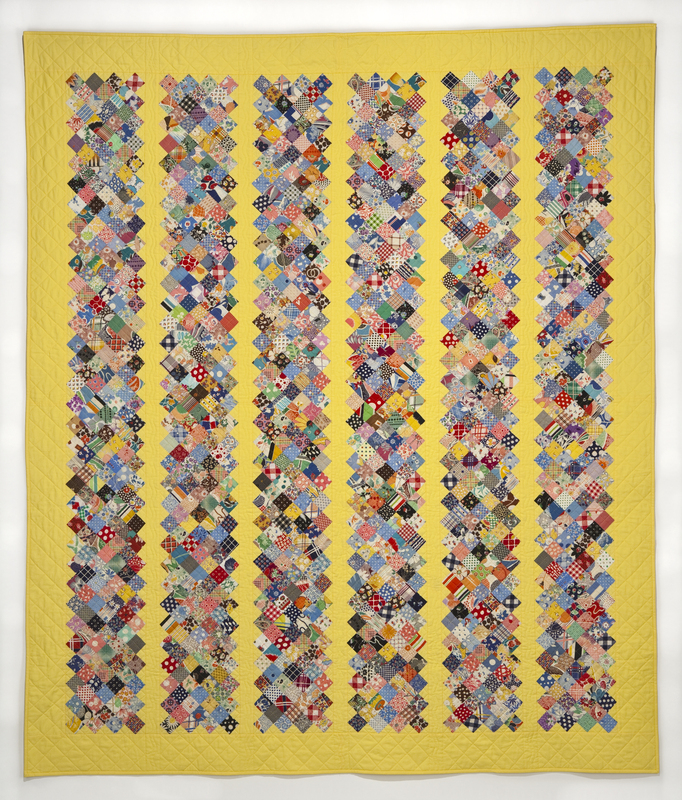 And, in keeping with the arrival of the New Year, I’m presenting a new quilt, one of the works that we photographed in Sibila’s studio in mid-December. I have shown this as a work-in-progress, and here is the finished product, with which I am very pleased. I don’t quite know how this one got so large: it just did. This size made the machine quilting a bit of a challenge (and chore), since I do my quilting on my regular Bernina, but my ability to play with new-to-me free motion quilting designs is what kept me as sane as possible during this long process. 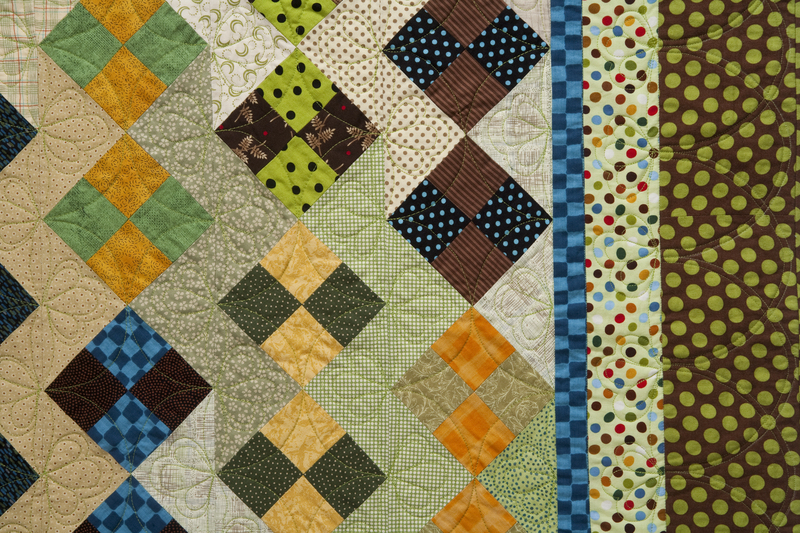 This quilt started out as one of my usual exercises in 2″ squares (click here for the other versions of this particular pattern): pull a big pile of squares, and start sewing them together into four patches. I used the colors in the polka-dotted middle border as the original inspiration. As I progressed, however, I found that adding more and more colors seemed to work well. Any lighter hues of the greens and browns were saved for the streak o’ lightning sashing. For the quilting, I created patterns that repeated vertically, which I thought would make things a bit easier. Each of the two patterns (one through the sashing and one through the four patches) required two passes to complete, but were simple and fun enough to keep me interested. I can’t say that I am done with this quilt pattern, because every time I make it I love the results, and each one looks very different. Truly are “fun” fours. BTW: Unlike quilters in previous generations who put intentional mistakes in their quilts because only God was “perfect”. I did not put that piecing error in on purpose. Random question of the day: Why does spell check always want me to change “sashing” to one of the following: slashing, smashing, stashing, swashing (WTF ?!? ), sating, sassing, or cashing???????? For the holidays I decided to present a post with almost all of my Christmas quilt creations in one place. You may not have seen some of these if you are new to this site, and I don’t have pictures of a few that I gifted away (that’s you, Diane and Dave), but there are photos of most of the rest. I recently realized I did not have any pictures of either of the two Christmas quilts made in the Simple Pleasures pattern (for more info on this pattern click here. ), so I corrected that deficit at the most recent photo shoot in Sibila’s studio. After all this time, I still love this pattern, which looks wildly different with every change in the fabric choices. 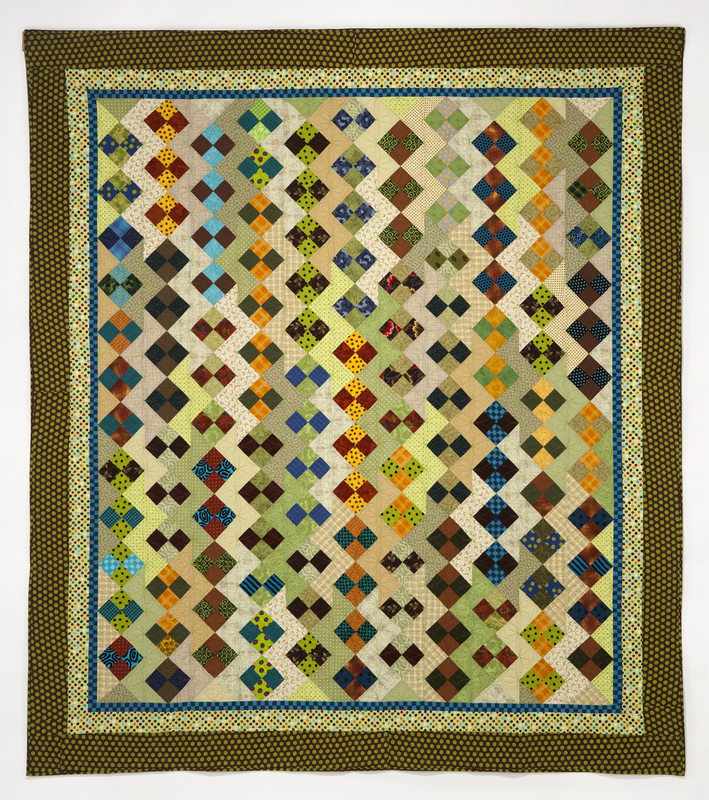 Patrick’s quilt is from the 2″ Squares series, at the same link as above. Also at the same link is this fun quilt made of 2″ squares set on the diagonal, with the fabulous snowmen borders. This one gets a professional shot soon, too. 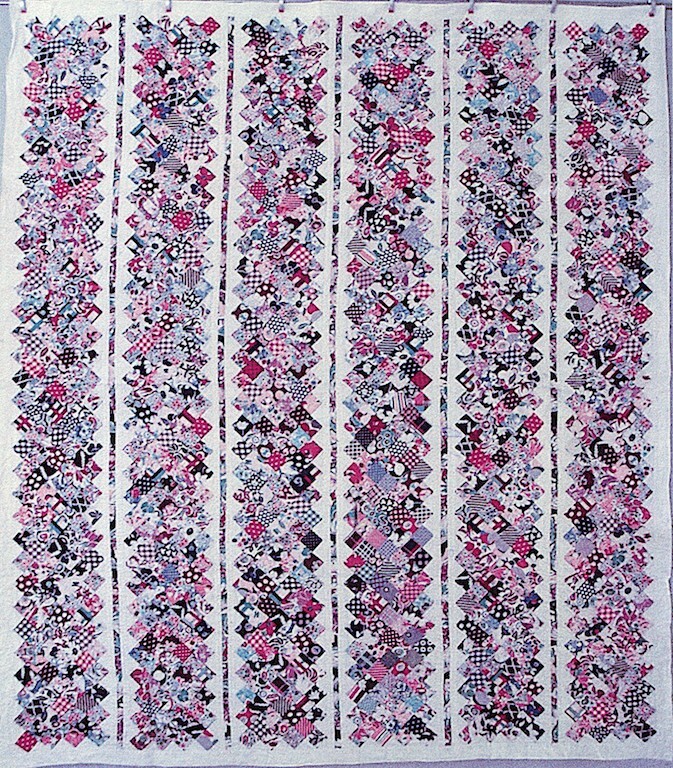 And, lastly, the most recent one, based upon the pattern from Maggie’s graduation quilt, described in detail here. So that’s it for this year. I look forward to sharing many, many more quilts and other fun things in the year to come.